PrintDiscrepancies: Why Do GDP Growth Rates Differ? Why Do GDP Growth Rates Differ? Abstract: Why do GDP growth rates differ? In this paper I show how GDP levels and growth estimates travel from national statistical offices to international databases maintained by international financial institutions as well as datasets maintained by scholars. It makes the point that, strictly speaking, these databases are secondary sources, and only through meticulous backward tracking of how different data series have travelled from statistical offices to international datasets can their quality be determined. Thus far, most research has focussed on the different biases or changes resulting from different methodologies of harmonisation, such as different methods of expressing series in international currencies. This paper emphasises the role of the uneven application of benchmark revisions, clerical errors, and political negotiation in accounting for discrepancies in different sources of reported GDP growth rates. Keywords: Economic growth, statistics, databases, national accounts, World Bank. When I did my Master’s degree in Economic History at the London School of Economics, I wanted to look into whether one could associate periods of economic policy change with changes in levels of economic growth. When I read the secondary literature, I soon found out that different scholars would report quite different GDP growth rates, and use them to support different interpretations. At some point during my Ph.D., I had a printout of all the growth rates for all African countries from 1960 to 2000 from diverse sources: the Penn World Tables, World Development Indicators, and Angus Maddison. Over my morning coffee, I would look at the big printout, circle big discrepancies and wonder why some data were missing in one dataset while a full set of observations would be present in another. It was at that point that I started questioning where the World Development Indicators and Penn World Tables got their data from. I wanted to determine which observations were mistakes or generated numbers and which were actual “information” (“data” based on real observations). If it were mostly just extrapolation and generated numbers with weak links to real information, the word “database” would not really be justified. It turned out that it was a mix. In this article, I lay out some of the main reasons for discrepancies in the reported growth rates. a method for filling the data gap, which is based on the assumption that the growth of the variable from a period for which data exist has been the same as the average growth for those other countries in the same regional or income grouping where data exist for both periods. This method is used to fill in the gaps for creating regional data. Possibly as a reassurance to data users, the World Bank reports that “these gap-filling procedures are run automatically, with no human intervention” (World Bank 2011a). It is therefore of some interest to uncover which of the data are actually GDP estimates, and which are simply imputed, created with “no human intervention.” In further interviews with the World Bank data group it has been made clear that when data are missing for individual countries the deliberations of the data group at the World Bank and advice from the country missions are used to generate country estimates. Part of the reason for lacking clear metadata in this case is thus quite simple. The gap-filling process is not rule-based. Quite a lot of discretion is exercised in the use of different sources and methods to fill these gaps. This procedure can result in discrepancies between the GDP data provided by the national statistical offices and the data generated at the World Bank. There are, of course, different ways in which such discrepancies can occur. In this paper, we identify many. It is evident that such a discrepancy can arise only if data are possessed by the country but not reported to the Bank. The lack of national account files at the United Nations or the World Bank may indicate that the estimates are not yet ready and not yet reported, or it may indicate that the estimates are not yet ready, and that for time being the World Bank will use a forecast in place of an estimate. Discrepancies will then occur if there are no clear procedures for updating the database if and when official estimates become available. Discrepancies may also persist if there is disagreement between country economists and the statistical offices – either as to which GDP series should be in use, or regarding the pace of estimated economic growth. In this paper, we will see that all of these cases can arise in practice. Different scholars and databases report different growth and income numbers, and as time passes, the economic history of these countries, as written by numbers, is influenced as much by political negotiations as actual economic change in the respective countries. Users of these data should know which gaps have been filled and how. GDP is the sum of gross value added by all resident producers in the economy plus any product taxes and minus any subsidies not included in the value of the products. It is calculated without making deductions for depreciation of fabricated assets or for depletion and degradation of natural resources. It is then noted that data are in constant or current, and local or international, currency and that the base period “varies by country” (World Bank 2011b). The data manual to which we have referred earlier in this chapter only contains the generic mathematical formulas and definitions that are used to compile the data (World Bank 2011c). In the course of my Ph.D research on four countries (Botswana, Kenya, Tanzania, and Zambia), I found that annual GDP growth rates from World Development Indicators, Penn World Tables, Maddison, and official national accounts data varied so much as to bring definitive statements of the comparative growth experience into doubt. In order to deal with the uncertainty surrounding the evidence on growth, the thesis consulted the primary sources for growth data: national accounts for Botswana, Kenya, Tanzania, and Zambia (Jerven 2014d).7 The reporting of data sources by international organisations leaves a lot wanting. As noted, one source reports the other as being its main source, and vice versa. The series are loosely based on national account data files, but it is not clear which sources are used and how these are assembled into continuous time series. The primary evidence comes from the official national accounts data. The key difference between the official national accounts data and the data available from the other databases is that the national accounts do not provide a continuous series for the whole post-colonial period. National accounts, as compared to sources like WDI, PWT, or the Maddison data, are, strictly speaking, the primary sources of data. The data available from the international series have largely been passed on from governments and statistical bureaus and may have then been modified, harmonised to fit the purpose of the data retailer and their customers. The data should therefore be considered secondary sources.8 These alterations create some problems; a comparative judgement on economic performance might depend on which source of evidence on growth was used. It is unsatisfactory to work with data where no proper sources are given and there is no immediate indication as to why different sources disagree. The inaccuracy underlines the importance of consulting primary evidence in economic analysis. The growth observations in the databases bridge years in which no official data were available, and where different base years were used. The only way inconsistencies in the data and effects of revisions can be dealt with satisfactorily is by consulting the primary source. The advantage of using national accounts is that they come with guidelines and commentaries. When the underlying methods or basic data involved in assembling the accounts are changed, these changes are reported. A major inconvenience with respect to national accounts data is that they are not readily downloadable. The publications have to be collected manually, and then the process of data entry and interpretation follow. Thus my study in my thesis and in Poor Numbers was based on research visits to the statistical offices. In each country I read reports and handbooks on methodology and I supplemented information gained with consultations with the representatives of central statistical offices. There is other research into the variation in data quality in the datasets. Johnson et al. (2009) studied the methodology of one of the most frequently used datasets for economic research, the Penn World Tables (PWT), and found variation between versions, and that the purchasing power parity (PPP) methodology introduced higher volatility in the series. Cicconi and Jarocinski (2010) studied the impact of the difference in the growth data in the PWT following the 6.2 revision and found that testing the same annual specifications of the relationship between growth and other variables across the two data series led to substantial changes with respect to the role of government, international trade, demography, and geography. They concluded that margins of error in international income estimates appeared too large for agnostic growth empirics to be deemed robust. Jerven (2010) did the same analysis for GDP level estimates for the African sub-sample and found that variation in ordinal ranking according to GDP level estimates was surprisingly large. Why was there so much disagreement in the GDP level data? In part, the systematic variation in values reflects the fact that the income per capita measures are quoted in international dollars from different base years in Maddison, WDI, and PWT. Furthermore, the income estimates reported in the datasets differ because different formulae were used to calculate the purchasing power parity (PPP) values used in international price comparisons. However, the methods applied to express the income estimates are quite similar and should not alone account for such differences in ranking. Maddison (2010) himself notes that “the discrepancy between the World Bank and my estimates is bigger than can be explained by the bias of the EKS (Elteto, Koves, and Szulc) measure.” The main problem may lie in differences in the use of primary sources, and in particular, primary sources that use different benchmark years. The international GDP per capita datasets all take the national account files as provided by the appropriate statistical agencies as a starting point, although they may use them differently. They may, moreover, impute data in different ways in different cases. Of course, the datasets necessarily inherit all the data quality problems originating in the country. Thus, many of the numbers may be misleading to begin with. However, the way they are generated through secondary operations upon this data may create new difficulties. While all the databases have the same starting point, they make use of different national account series, before or after some revisions. Maddison actually did primary research in some cases, and generated his own national account estimates from archival data.9 The database is a mix of historical national account estimates, official national account files, and the use of individual judgement and secondary data to fill in gaps or breaks in the series. The United Nations and IMF International Financial Statistics basically re-report national account files, if and when they are received, whereas both the World Bank and PWT aim for a gap-free database. The PWT in particular relies largely on collating United Nations and World Bank data; its primary contribution is to attempt to put these in “real” terms. There are differences not only in methods but also in the actual primary data used to create the harmonised series. The differences can be quite substantial depending on when the database was last updated, and which GDP data series was used. This paper contributes to the existing literature by analysing the three sources of dissonance in the data series: revisions to the benchmark years in GDP series; clerical errors, oversights, and lack of quality control when putting series together; and the role of negotiation and the political contestation of the numbers. Outright dissembling or wilful misrepresentation is less common. Most of the problems of getting the right numbers from countries stem from sheer lack of data and resources, and general ignorance, although sometimes politics matters too. On November 5, 2010, Ghana’s Statistical Services announced new and revised GDP estimates. Overnight, the size of the economy was adjusted upward by over 60 per cent. Implicit in this revision was that previous GDP estimates had missed about US$13 billion worth of economic activity (Jerven 2011a). While this change in GDP was exceptionally large, it turned out to be far from an isolated case. On April 7, 2014, the Nigerian Bureau of Statistics declared that their GDP estimates were also being revised upward to $510 billion, an 89 per cent increase from the old estimate (Jerven 2014b). These well-publicised statistical events have increased the attention being paid to the quality of macroeconomic statistics in low-income countries, especially in Africa. In a 2011 survey of the status of GDP statistics in Sub-Saharan Africa (Jerven 2013), it was found that, of 37 countries studied, only six followed the advice of the IMF to use a base year that was no more than five years old (i.e., 2006 or later).10 Two years later, the IMF’s Regional Economic Outlook for Sub-Saharan Africa (May 2013) collected some metadata on GDP statistics (IMF 2013b). This survey of 45 countries produced similar results, with only four countries meeting the five-year rule. Making matters worse was that, while 28 countries had base years more than 10 years old, 13 countries were still using base years more than 20 years old. The African Development Bank conducted a survey in 2013 (published in April) and, intriguingly, their report had different findings on the closeness of the base years, even though the surveys were both conducted in the spring of 2013 (Jerven 2014a). Depending on when and how these changes are implemented, these revisions in GDP estimates cause changes in the different databases at different times. The changes in growth rates can be observed by comparing old and new versions of the same database. Since 2014, the WDI has archived older versions of their own database, allowing one to observe this difference more easily. Figure 1 plots the growth series in Nigeria as published in April 2014 and as published in April 2015. The figure shows how changes in reported growth rates occurred as a result of the WDI having accepted Nigeria’s revised statistics. The graphs make clear that most of the upward revision in GDP resulted in an apparent watershed in economic growth in 2004 (a wholly implausible 34 per cent), one that did not exist previously (when growth was recorded as an already robust 10 per cent). Altogether, the average picture of growth in Nigeria has not changed much on average since 1960 (4.2 per cent versus 4.1 per cent). It is the distribution of growth over time that has changed. The new series reports an 8.2 per cent growth rate on average since 2000 (compared to a 6.5 per cent growth rate in the old series), and in the period between 1980 and 2000 the growth rate has more than halved, from 2.2 per cent to 1 per cent. The drop in the growth rate in the 1980s is caused by the new series reporting growth in 1986 and 1987 to be −9 per cent and 11 per cent, whereas the old 2014 series reported 3 per cent and −1 per cent respectively. It is difficult, based on the sparse information that is available about how this data series was updated, to determine why these changes happened so far in the past. The new GDP series in Nigeria as published by the Nigerian Bureau of Statistics (NBS), and now based on 2010 prices rather than 1990 prices, extends back only to 2010. Meanwhile, the GDP series at 1984 fixed prices as published by the NBS in 1999 indicates growth of 3 per cent in 1986, which agrees with the 2014 WDI series, but is 12 percentage points greater than is reported in the 2015 WDI series. Similarly, it reports zero growth in 1987, which agrees with the 2014 WDI series but is 11 percentage points greater than reported in the 2015 WDI series. It is difficult to tell what the source of these differences is from the data provided by the World Bank. It is hard to believe that assigning different sectoral weights (the Nigerian economy was less petroleum-dependent and more tertiary-sector-dependent in 2010 than in 1990) would only have had an impact in these years. The changes we see in the series appear in order to reconcile past levels deriving from an old series with present levels deriving from a new one. For most years, growth rates are intact, but in other years, there are adjustments. The size of the Nigerian economy is big enough to affect economic estimates for the entire African continent (Figure 2). When Nigerian GDP increased 89 per cent, total sub-Saharan African GDP increased by 20 per cent – an increase that amounted to approximately 58 times the size of the Malawian economy (Jerven 2014c). So not only did the economic history of Nigeria get rewritten that Sunday afternoon in April, but so did that of the African continent. The change in the Nigerian data from the 2014 to the 2015 series increased reported GDP growth in the year 2004 from 6 to 10 per cent. While the work of an economic historian may employ different sources of information, archival information figures prominently in it. Such information may take the form of statistical tables or of recorded statements by officials on economic trends and productivity. A qualitative statement may seem arbitrary, such as an evaluation of an agriculture harvest as “average” or “improved.” A statistical record of zero per cent or three per cent growth may appear more precise (Jerven 2012). As I recorded in Poor Numbers, some growth series, such as those on the agricultural sector, derive from qualitative observations (Jerven 2013). Having prepared national accounts for Nigeria in the 1950s, Okigbo (1962, p. 65) wrote that “it is impossible to overstate the arbitrariness of the process of ‘quantification.’” When preparing the estimates of agricultural production he had only a few unreliable observations from agricultural officers who reported their observations. 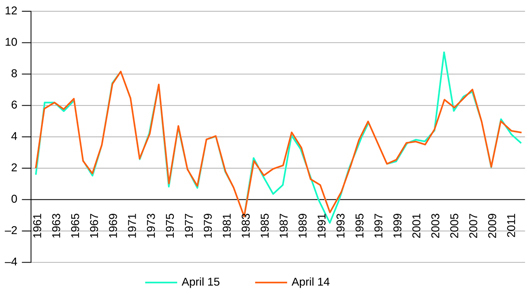 Based on these data, Okigbo prepared a time series for 1950–1957. An odd feature of the online databases is that, in contrast to published sources, online databases containing comprehensive historical series may provide a changing and different picture of the past in the light of new information about the present. On first appearance, this may not seem a deep distinction. Even published sources can and do sometimes report a new series for historical data. The big difference, however, is that as an end user, one is not normally able to browse through different versions of the online database, whereas in the case of the published yearbooks, one can check the changes from one physical copy to the other. In the present case, the national accountants in Abuja provided new and supposedly improved coverage in the GDP estimates for 2010–2014, but it is not obvious how or why this new information should alter the interpretation of the past. More particularly, it is not clear whether the new picture of the past is generated according to a formula or whether new values for the past are fitted according to the judgement of a country expert as to what would make the most sense. My hypothesis is that some of these mistakes or odd jumps in the databases would not be accepted if they were for the GDP time series for Germany or the USA. For sure, there are revisions that cause jumps in these countries too, but because of larger interests (and sometimes, at least, perceived importance) the obvious weaknesses in harmonisation would not pass. There are more hands at work, and people who may not only notice the oddities, but may also work out better adjustments. Relatedly, the historical economic databases are better maintained, so that if there is a revision (for instance, to what is considered value added), adjustments are likely to be based on real historical data rather than on guesstimates, interpolation, and extrapolation. I came across a simple clerical error when working on long term growth trends in Kenya recently. I downloaded a data series on growth from the World Bank database but was surprised at what I found. I could not make the information match with what I remembered using for my doctoral thesis six years previously. The database reported a 91 per cent growth rate in 1961, while the World Bank had previously reported a −7.8 per cent for that year. This time I tweeted the World Bank Data group: “Dear @worldbankdata, Why do you now report 91 per cent growth in Kenya in 1961, when you reported −7.8 per cent for 1961 previously?” To their credit the World Bank Data Group responded quickly: “@MJerven Thanks for the catch, we made a calculation error doing the base year change. Will be fixed + updated within the next day or so” (Jerven and World Bank Data 2015). It was fixed back to −7.8 per cent in the March 2015 version, but the 91 per cent growth was in the versions published in December 2014 and in January 2015. A classic case of a clerical error that persisted in the databases was reported in my research on Tanzania (Jerven 2011b). I did a comparison of the growth rates reported in Tanzania by the Penn World Tables, Maddison, and the official national account files. First of all, the general lack of agreement on annual growth in Tanzania from these sources was striking. Between the most commonly used source for economists, the Penn World Tables, and the annual growth rates published by the national statistical office, there is so little agreement that one would be forced to describe the two sets, supposedly describing the same phenomenon, as having no relationship to one another. The annual highest growth rate and lowest growth rate across the three data sources are plotted in Figure 3. The difference between the highest (maximum) and the lowest (minimum) reported growth rates represent the annual range of disagreement. Of course, Penn World Tables were reporting “real growth rate” with components of GDP valued at international prices whereas the statistical offices were reporting local constant price growth rates, so it is “real” growth in domestic terms. This is a reason to expect some discrepancy, but again, not the types of discrepancies found here. Source: Details in Jerven (2012); Tanzania: National Account Files, World Bank (2003); Heston, Summers, and Aten (2006); and The Maddison Project (2009). In 1997, the methods and data used to estimate GDP were revised. The new GDP series was based on 1992 prices. The report on the revision highlighted the fact that the decline of the formal economy and the growth of the informal economy in the 1980s and 1990s were not reflected in the available statistics, resulting in an underestimation of value added. “Estimates of the size of this deficiency ranged from 30 per cent to as much as 200 per cent of GDP.” (United Republic of Tanzania, Bureau of Statistics, p. 1) New and higher estimates included fresh surveys of transport, trade, and construction, and when compared with the previous series, the report noted that the “private sector was under-covered – sometimes not covered at all – and the growing informal sector was not generally accounted for.” (ibid.) In short, there is a break in the series. A World Bank publication records that national accounts methods were modified in 1995 and that a revised series was published in 1997 (Ndulu and Mutalemwa 2002). It was further noted that these revisions only went back to 1987, which meant that the World Bank decided not to report growth data for the earlier period and accepted a break in the series in this case. The Penn World Tables, trying to reconcile the conflicting estimates, left the discrepancy in their data series. 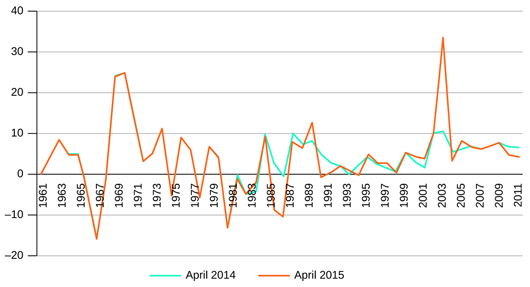 In Figure 3, the large drop in 1988 in the Penn World Table series is evident. Maddison and the official national accounts series report steady growth, of about 3 to 5 per cent from 1985 to the 1990s (Jerven 2011b). I noted these mistakes in publications in 2011 and 2012, but the latest version of the Penn World Tables 8.1 still contains errors for growth in the 1980s. The high negative growth rate in the Tanzania growth series has led to erroneous conclusions by data users. In the Handbook of Economic Growth, Durlauf et al. (2005) argued that negative “output” shocks are a phenomenon typical among low-income countries. They were using the Penn World Tables, and, not realising it was purely a statistical artefact, they included the period from 1987 to 1990 in Tanzania on their “top ten list” of output collapses. It seems that when economic development experts are not country experts, the road from fact to fiction is short. The malleable nature of the data also provides an opportunity for more sinister uses of statistics, as we move from ignorance and benign neglect to opportunistic tampering with soft numbers. It is not easy to draw the line between these categories. 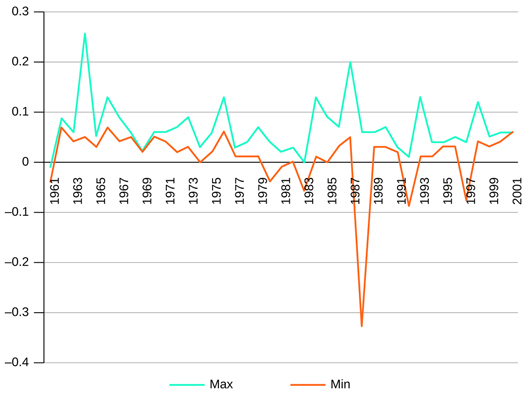 Mwase and Ndulu are aware of the Tanzanian revision and in a footnote to a figure (Ndulu and O’Connell 2008, p. 7) in the econometric analysis it was noted, “1988 is treated as a missing observation because the series shows an erroneous massive downward adjustment in that year.” However, simply treating 1988 as void is unsatisfactory, because it creates an illusory picture of higher growth during the period. It does not solve the problems of the Penn World Table series, and the resulting evidence misleadingly strengthens the hypothesis of a sharp recovery in growth during the reform period (see Table 1). In 1987, the Penn World Tables data showed massive growth, an increase that is not supported by any other evidence. This makes it likely that the revised Penn World Tables series has seriously overestimated post-adjustment growth in Tanzania. The average growth rate between 1985 and 1995 is less than 2 per cent if the negative growth rate is reported for 1988 but it jumps to 5.4 per cent if it is removed. For the year 1987, the Penn World Tables reported 20 per cent growth while Maddison and the official data reported 5 per cent growth. A clerical error in one dataset allows researchers to present a quite different picture of growth performance after structural adjustment than would have been possible without the clerical error. The presence of such errors and discrepancies allows room for opportunistic interpretation of the evidence. The pressure to report high growth numbers may be strong and may be difficult to resist. I have emphasised that I think that the main sources of dissonance in the growth data and their loose relationship with real economic trends is more due to the fact that it is difficult to measure these things, and that sometimes the combination of inappropriate definitions, lack of access to real data, and shortage of human resources simply leads to poor numbers. Indeed, one of the things that has struck me in the course of discussing my research over the past years is how data users often possess a healthy suspicion of any “official number.” At the same time, some institutions are more trusted than others. Some scholars may never trust a number from Sudan, Ghana, or South Africa, but would not hesitate to use the same number if the World Bank recycles it. One of the difficulties of figuring out whether numbers are overestimating or underestimating growth is simply that it is hardly obvious which are the true or correct numbers. Rather, the numbers are just a multitude of estimates and guesstimates, and it is difficult to judge which one to trust more than the other. There has been some research that tries to unearth the biases deriving from changes in methodology (Jerven 2013, 2014b). More recently Magee and Doces (2015) argue that growth data submitted to international agencies are more overstated by authoritarian regimes than by democracies. To measure the degree to which each government's official growth statistics are overstated, the economic growth rates reported in the World Bank's World Development Indicators are compared to a new measure of economic growth based on satellite imaging of nighttime lights. According to this comparison the authors claim that annual GDP growth rates are estimated to be overstated by 0.5–1.5 percentage points in the statistics that “authoritarian regimes” report to the World Bank. In a similar vein, Dreher et al. (2008) argue that IMF forecasts are subject to political economy pressures. It is shown that countries that are on the United Nations Security Council tend to have lower inflation forecasts when elections are approaching. The hypothesis the authors want to investigate is whether countries that are more important are more likely to be allowed to “get away” with higher growth and lower inflation forecasts than countries that have less political leverage. Indeed, forecasts are often made by international organisations, and as discussed previously, may make their way into databases as growth estimates. In many low income countries the ability to estimate growth based on actual data is sometimes wanting and therefore, the forecasts may very well stand in for actual estimates for a long time. In some databases the estimates can be relied upon permanently in lieu of updating the database (Jerven 2014c). Kerner et al. (2015) show that the distribution of GNI per capita estimates is clustered just below the per capita threshold that determines eligibility for funding from the International Development Association (IDA). In theory, the World Bank compile these GNI per capita estimates without any influence being exercised by the country officials, so that the estimates are put together fully independently, using the data available to the Bank. In practice, there is, of course, interaction, and the data files are incomplete. In sum, Kerner, Jerven, and Beatty find that over time there are “too many” countries just below the threshold that qualify a country for World Bank concessional loans, while there are “too many” countries just above that same threshold. Official GDP growth rates imply productivity increases that appear implausible, suggesting an urgent need to reconcile the historical difference between official GDP statistics and the staff estimates and to ensure accuracy of source data (IMF 2012). The other databases, such as the World Bank database, normally take data from these Article IV missions to populate the gaps in their own datasets. In other countries, where reported growth rates are also implausibly high, but relations are better, such inaccuracies may be forgiven without correction in the reports sent back to head office, and similarly the data travels to international databases without any caveat. With such uneven practice with respect to what is reported from one year to another or with regard to the extent to which corrections are undertaken, the political element appears to be forever pertinent. This paper showed some discrepancies in reported growth rates in international databases for low-income countries, and asked why these appear. It has been shown that big discrepancies arise as a result of methods that are often not made the subjects of scrutiny. For instance, different ways of dealing with breaks in series as benchmarks change may have large consequences for countries for which there are very meagre real databases. Similarly, there are simple mistakes being committed when time series data are compiled. Some of these errors have been corrected but some stand uncorrected. Finally, the role of political pressure may sometimes matter. Users of the data should educate themselves, and beware. When you are downloading data from international databases on economic growth you are using borrowed, secondary data that are often based on guesswork and may incorporate errors. It is the duty of a researcher to ask who made the observation and where it was made, and whether there is any reason to think that the observation is biased. If one fails to ask these questions, and uses the reported growth rates uncritically, the problems of the data are being compounded. 1 After I expressed this concern, and to the Data Group’s credit, they have started reporting better country-level metadata with their datasets. This is an important step on the road to transparency with regard to data quality, though there is still a long way to go. 2 Email correspondence with the Development Data Group at the World Bank, September 8, 2009. When I presented this information to the Data Group at the World Bank in a talk at the Centre for Global Development in November 2011, the director first denied that these data were confidential, and claimed that I had been misinformed or had been asking the wrong question. When I showed them the email with my question and the response, it was conceded that indeed some of this data are not shared. I have since re-requested access to raw data (specifically for Ghana and Tanzania to see what changes have been made to the long term growth series) but I have not been given access. 3 Email correspondence with Development Data Group at the World Bank, September 10, 2009. 4 Email correspondence with Data Dissemination and Client Services Team, Statistical Information Management Division, Statistics Department, International Monetary Fund, September 16, 2009. 5 Email correspondence with the Centre for International Comparisons, University of Pennsylvania, September 21, 2009. 6 Email correspondence with the Centre for International Comparisons, University of Pennsylvania, September 22, 2009. 7 For further case studies of the problems arising from data quality problems in economic growth analysis, see Jerven (2010b), a comparative study,or Jerven (2010c) (on Botswana), Jerven (2011a) (on Kenya), and Jerven (2011b) (on Tanzania). For an attempt to historicise the African national income data see Jerven (2011c). 8 Of course, this distinction cannot be made so cleanly partly because the World Bank or, more likely, IMF country officers are sometimes actually making the observations. So, for the actual official estimates, the national statistical offices are the primary source (although IMF or other technical assistance may often help producing these numbers), whereas other forecasts or estimates that are made in the case of missing data are indeed coming from the IMF or the World Bank, but may sometimes travel to other domains as the equivalent of an official statistic. 9 For a review of historical national accounts, see Jerven (2012), and for an application to the Gold Coast Colonial Archival Data, see Jerven (2014e). 10 This principle is rather arbitrary. It was quoted to me in an interview as general IMF advice from Technical Assistance divisions (Jerven 2013). When the AfDB wrote their report, also in 2013, they called it “the five-year rule.” I am not sure, but it may very well be that the general advice that “one should update the benchmark year periodically, particularly if there are large structural changes, relative price changes or other changes that indicate that the benchmark of the country needs updating,” when quantified, produced the number “5.” The need for these updates clearly depends on various factors, including whether the database is good enough to allow for constructing chain indexes that may make such episodic revisions less necessary. 11 For a complete discussion of the growth time series evidence on Tanzania, see Jerven (2011). Ciccone, Antonio, and Jarociński, Marek (2010), “Determinants of Economic Growth: Will Data Tell?” American Economic Journal: Macroeconomics, vol. 2, no. 4, pp. 222–46. Dreher, Axel, Marchesi, Silvia, and Vreeland, James Raymond (2008), “The Political Economy of IMF forecasts,” Public Choice, vol. 137, no. 1-2, pp. 145–71. Durlauf, Steven N., Johnson, Paul A., and Temple, Jonathan R. W. (2005), “Growth Econometrics,” Handbook of Economic Growth, vol. 1, pp. 555–677. Geda, Alemayehu, and Yimer, Addis (2014), Growth, Poverty and Inequality in Ethiopia, 2000–2013: A Macroeconomic Appraisal, available at https://www.researchgate.net/profile/Alemayehu_Geda/publication/264004552_Growth_Poverty_and_Inequality_in_Ethiopia_2000-2013_A_Macroeconomic_Appraisal/links/00b7d53c88d4ed0f9e000000.pdf, viewed on December 1, 2015. Heston, Alan, Summers, Robert, and Aten, Bettina (2006), Penn World Tables Version 6.2, Centre for International Comparisons of Production, Income and Prices at the University of Pennsylvania, available at http://pwt.econ.upenn.edu/, viewed on December 1, 2015.
International Monetary Fund (2012), Ethiopia: 2012 Article IV Consultation, available at http://www.imf.org/external/pubs/ft/scr/2012/cr12287.pdf, viewed on December 1, 2015.
International Monetary Fund (2013a), Ethiopia: 2013 Article IV Consultation, available at http://www.imf.org/external/pubs/ft/scr/2013/cr13308.pdf, viewed on December 1, 2015.
International Monetary Fund (2013b), “Sub-Saharan Africa: Building Momentum in a Multi-Speed World,” available at http://www.imf.org/external/pubs/ft/reo/2013/afr/eng/sreo0513.pdf, viewed on August 16, 2013. Jerven, Morten (2010a), “The Relativity of Poverty and Income: How Reliable Are African Economic Statistics?” African Affairs, vol. 109, no. 434, pp. 77–96. Jerven, Morten (2010b), “Random Growth in Africa? Lessons from an Evaluation of the Growth Evidence on Botswana, Kenya, Tanzania and Zambia, 1965–1995,” Journal of Development Studies, vol. 46, no. 2, pp. 274–94. Jerven, Morten (2010c), “Accounting for the African Growth Miracle: The Official Evidence, Botswana 1965–1995,” Journal of Southern African Studies, vol. 36, no. 1, pp. 73–94. Jerven, Morten (2011a), “Revisiting the Consensus on Kenyan Economic Growth, 1964–1995,” Journal of Eastern African Studies, vol. 5, no. 1, pp. 2–23. Jerven, Morten (2011b), “Growth, Stagnation or Retrogression? On the Accuracy of Economic Observations, Tanzania, 1961–2001,” Journal of African Economies, vol. 20, no. 3, pp. 377–94. Jerven, Morten (2011c), “Users and Producers of African Income: Measuring African Progress,” African Affairs, vol. 110, no. 439, pp. 169–90. Jerven, Morten (2012), “An Unlevel Playing Field: National Income Estimates and Reciprocal Comparison in Global Economic History,” Journal of Global History, vol. 7, no. 1, pp. 107–28. Jerven, Morten (2013), Poor Numbers: How We Are Misled by African Development Statistics and What to Do About It, Cornell University Press, Ithaca. Jerven, Morten (2014a), “African Growth Miracle or Statistical Tragedy? Interpreting Trends in the Data Over the Past Two Decades,” WIDER Working Paper No. 2014/114, UNU-WIDER, Helsinki. Jerven, Morten (2014b), “What Does Nigeria’s New GDP Number Actually Mean?” African Arguments, available at http://africanarguments.org/2014/04/08/what-does-nigerias-new-gdp-number-actually-mean-by-morten-jerven/, viewed on December 1, 2015. Jerven, Morten (2014c), “Why Saying ‘Seven out of Ten Fastest Growing Economies are in Africa’ Carries No Real Meaning,” African Arguments, available at http://africanarguments.org/2014/08/26/why-saying-seven-out-of-ten-fastest-growing-economies-are-in-africa-carries-no-real-meaning-by-morten-jerven/, viewed on December 1, 2015. Jerven, Morten (2014d), Economic Growth and Measurement Reconsidered in Botswana, Kenya, Tanzania, and Zambia, 1965–1995, Oxford University Press. Jerven, Morten (2014e), “A West African Experiment: Constructing a GDP Series for Colonial Ghana, 1891–1950,” Economic History Review, vol. 67, no. 4, pp. 964–92, Nov.
Jerven, Morten (2016), “Data and Statistics at the IMF: Quality Assurances for Low-Income Countries,” Background Paper, Independent Evaluation Office of the International Monetary Fund, Washington D. C., Feb 25. Jerven, Morten and World Bank Data (2015, Mar 10), Twitter conversation, retrieved from https://twitter.com/worldbankdata/status/575391634608750592. Johnson, S., Larson, W., Papageorgiou, C. and Subramanian, A. (2009), “Is Newer Better? The Penn World Table Revisions and Their Impact on Growth Estimates,” NBER Working Paper No. 15455. Kerner, Andrew, Beatty, Alison, and Jerven, Morten (2015), “Does It Pay To Be Poor? Testing for Systematically Underreported GNI Estimates,” Review of International Organisations, pp. 1–38. Maddison, Angus (2010), Background Note on “Historical Statistics,” available at http://www.ggdc.net/maddison, viewed in July 2011. The Maddison-Project (2013), 2013 Maddison Project Version, available at http://www.ggdc.net/maddison/maddison-project/home.htm, viewed on May 31, 2016. Magee, Christopher S. P, and Doces, John A. (2015), “Reconsidering Regime Type and Growth: Lies, Dictatorships, and Statistics,” International Studies Quarterly, vol. 59, no. 2, pp. 223–37. Ndulu, Benno J., and Mutalemwa, Charles K. (eds.) (2002), Tanzania at the Turn of the Century: Background Papers and Statistics, World Bank Publications, Washington, D. C.
Ndulu, Benno J. (2008), The Political Economy of Economic Growth in Africa, 1960–2000, Cambridge University Press. Okigbo, Pius N. C. (1962), Nigerian Nigerian National Accounts, 1950–57, Government Printer, Enugu. The United Nations, The United Nations Database, available at http://data.un.org/, viewed in August 2011. United Republic of Tanzania, Bureau of Statistics, Report on the Revised National Accounts, 1986–87. World Bank (2011a), “Method of Gap Filling,” available at http://go.worldbank.org/, viewed in July 2011. World Bank (2011b), The World Bank Database, available at http://data.worldbank.org/, viewed in August 2011. World Bank (2011c), World Bank Statistical Manual, National Accounts, available at http://web.worldbank.org, viewed in August 2011. World Bank Group (ed.) (2003), World Development Indicators 2003, World Bank Publications, Washington, D. C.
Young, Alwyn (2012), “The African Growth Miracle,” Journal of Political Economy, vol. 120, no. 4, pp. 696–739.